(UM Legislative News Service) The only constitutionally-mandated assignment for state lawmakers is to construct a balanced two-year budget, and the 66th Montana Legislature is ahead of schedule. Butte Democratic Sen. Jon Sesso said on the Senate floor that approving a budget this early is “fairly unprecedented.” Last week, senators voted to pass an amended version of a budget 28-21. The House must approve the amendments, and then it will be sent to the governor. The process of passing House Bill 2, the bill that outlines the budget, begins with a revenue projection and a proposed budget from the governor before the session starts. The process doesn’t end until the final days before adjournment. Drafting the budget can be high stakes for government agencies and government-funded programs, which must set their budgets based on the Legislature’s final say. As the session nears adjournment, the budget is beginning to take its final form. And although the road for HB 2 has been relatively smooth until now, there are still several other spending bills that are sparking intense debate over how to spend money and how to raise money. Last week, the Senate began debating whether or not to pass a Medicaid expansion bill, one that would continue the state-federal partnership program that insures about 96,000 Montanans. The bill passed the House, but after several days of maneuvering in the Senate, it was still up in the air by the weekend. Senate President Scott Sales, R-Bozeman, spoke in adamant opposition to the bill on the grounds that it costs too much. “The runaway spending that this bill promotes isn’t good for future generations. It’s good this generation. And to hell with the people who are going to pay the bill, which are my kids and my grandkids, and yours too,” Sales said. The federal government provides a 90 percent match rate for Medicaid expansion, so the state must kick in 10 percent. Some Republicans have voiced concern that the state’s share will increase in the future. And while some worry the state cannot afford to spend more money, others are worried about programs being cut. For example, in 2017, the Legislature approved funding for a public preschool pilot program called STARS Preschool. It provided for two years of public pre-K in 18 school districts, but is expiring after this session. Alberton School District received one of the grants, and Superintendent Steve Picard said he will be “devastated” if funding is not renewed. “I sure hope something comes through, because I realize the impact it has on these kids,” Picard said. Picard said he will do his best to find ways to pay for the program on the district’s dime, but its continuance is uncertain. That uncertainty creates further strain for the district to find a teacher and set its annual budget, Picard said. Two bills were introduced earlier in the session that proposed creating a statewide preschool program, but both have been tabled and are likely dead. Funding could still be added in HB 2, but that is yet to happen. 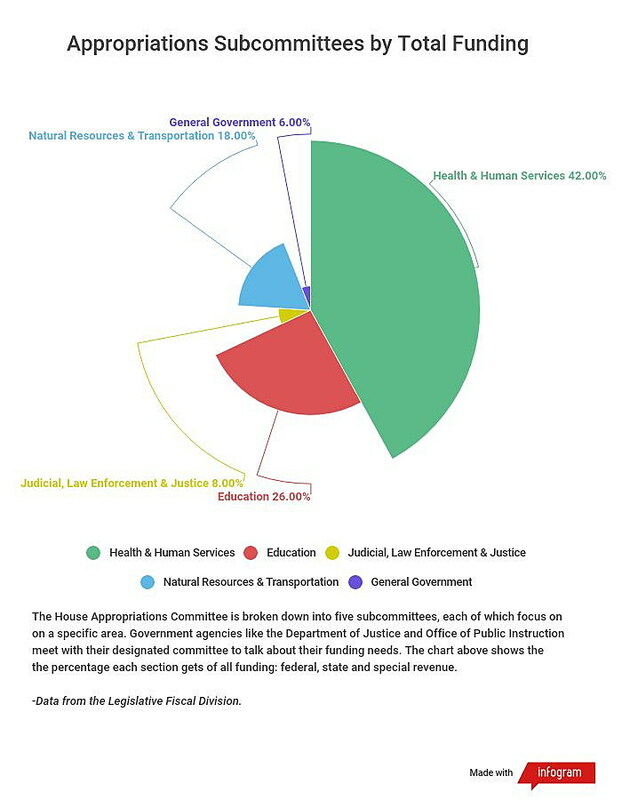 The budget is essentially a reflection of what a majority of lawmakers prioritize to fund. Big issues like Medicaid expansion, infrastructure and public education often reveal the big political divides. Rep. Nancy Ballance, R-Hamilton, is co-chair of the House Appropriations Committee and said the only way to find compromise on priorities is to debate them. “The best you can do is talk about it all along the way,” Ballance said. Debates over the state budget may be most visible at the end of a legislative session, but the process starts at the very beginning. The House Appropriations Committee is in charge of sorting through each government agency and each lawmaker’s request for funding. It’s broken down into five subcommittees that start on the budget in the early days of the session. Bills can ask for an appropriation from the state or from special revenue from taxes that the state collects. Proposals range from using money from the medical marijuana tax for mental health services to taking $22 million from the general fund to pay for public preschool. Of course, the government cannot afford every request for money, even if lawmakers like the policy. Ballance said some bills are killed or are vetoed simply because of a lack of funding. And, she said, the state needs to keep a reserve. “You have to draw the line somewhere and leave money in the bank,” she said. Ballance said that she encourages lawmakers who can’t find funding for good policy to bring it the idea back the next session. Some lawmakers, and Democratic Gov. Steve Bullock, would argue the government could find more funding by increasing taxes and fees that feed the state’s general fund. 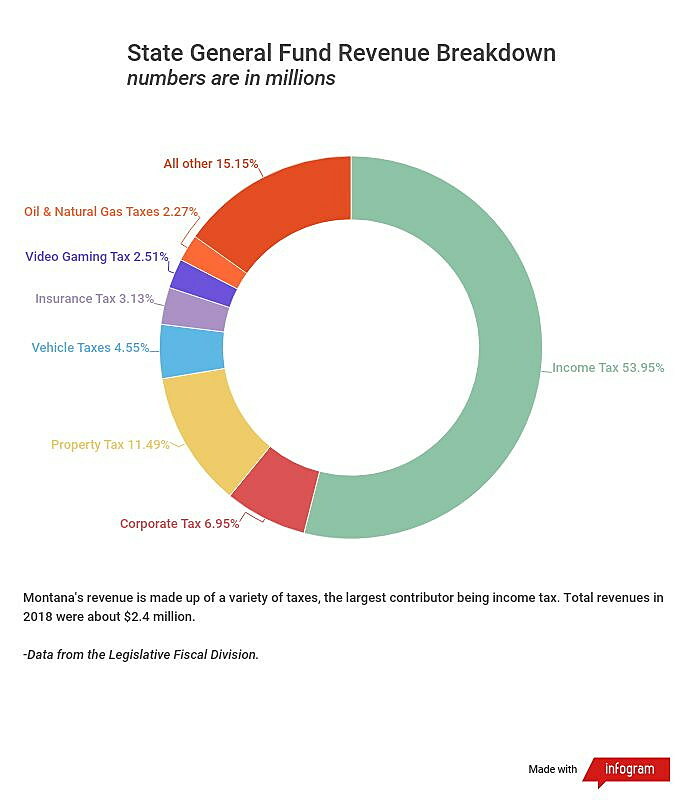 Bullock’s proposed budget included increased taxes on accommodations, rental cars, tobacco, liquor, and an increased fee on investment adviser licenses. All have been tabled or killed in committee. When lawmakers draft the two-year budget each session, they have to use revenue projections to decide how much they can spend. Market changes, like a change to the federal tax structure, can make those projections volatile, and that’s a concern. The governor’s office and the Legislative Fiscal Division each release revenue estimates, and the Legislature chooses to adopt one. Based on the estimate, lawmakers add or subtract money from HB 2. “We need to have a budget that brings in more money than spending,” Bullock said last week. In 2017, revenue projections were off and Bullock called the lawmaking body back for a special session to make cuts to spending. Agencies like the Department of Health and Human Services felt the hit. Lawmakers would like to avoid another special session. Rep. Ryan Lynch, D-Butte, is vice chair of the appropriations committee and said the proposed budget restores some of what was cut in 2017. He said having a sufficient reserve could prevent another shortfall. “We’re committed to making sure there is enough working capital that if something does happen, the Legislature doesn’t have to come back to town,” Lynch said. Ballance said she thinks lawmakers are likely to use a conservative revenue estimate for this session’s HB 2. “My guess is that everyone will be a little afraid to take an estimate that is up (in revenue),” Ballance said. Both of the last two projections released by the Legislative Fiscal Division show revenues down by more than $35 million from the first projection released in December. Rep. Alan Redfield, R-Livingston, is chair of the House Taxation Committee and said the change in estimated revenue isn’t substantial. And while there are more bills asking for money than those that generate money coming of the House, Redfield said that won’t affect the final HB 2. “I expect to see a lot more bills put down in Senate Finance and Claims,” Redfield said.